Does Your Friendship Matter?This past Sunday we looked at why God wants us to have friendships with people who are "on the margin," people who are social outcasts, and simply people who don't know Jesus yet. I wonder what would happen if each of us would commit to becoming friends with just 1 person outside our Christian and Church circle. Someone who needs a friend who will listen. Someone who needs a friend who will point them to Jesus by our words and by our life. Someone who would be willing to work through the hard questions? You were born to be that person. The one who offers genuine friendship and a safe place for a searching person to find God. If you missed this week's message, you can watch it here. Let's continue to be in prayer about what God wants us to do, and how He wants us to engage in the opportunity to participate with city churches and ministries in this outreach event. 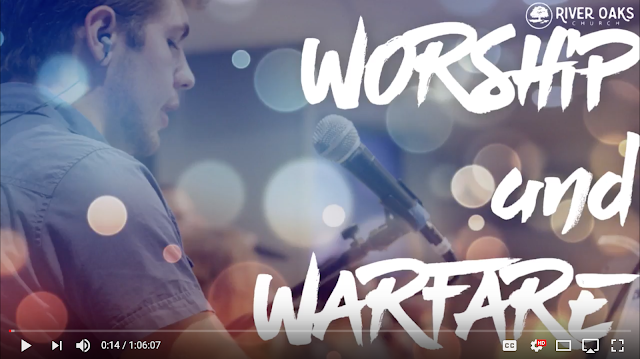 This past Sunday at River Oaks, we experienced a service where we incorporated warfare in our worship. It is really the most natural thing to do. As we worship, our hearts and souls are drawn to the magnificence, the power, the presence and the reality of God active in our lives and in the circumstances we face in everyday life. While worshipping, God speaks and we have the opportunity to engage with Him, knowing that everything we ever accomplish is from Jesus and through Jesus. It is our task, however, not to sit back and watch Jesus work, but to engage as He works. I shared the fact that every struggle, every situation in our lives is a reflection in the natural (what we can see), of what is going on in the spirit realm (angels and demons). If you missed the message, you can watch it here. Welcome to our new blogging site for news from River Oaks. Our updates will appear here and will be available via RSS and Apple News as soon as possible.